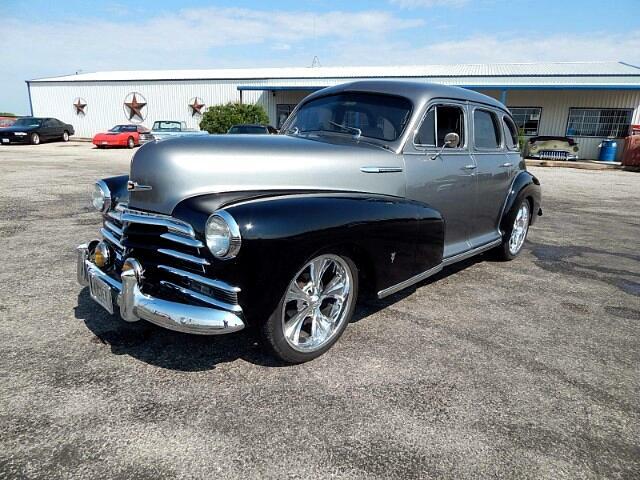 Just In This Super Nice Multi Show Winning 1947 Chevrolet Fleetmaster Custom Street Rod Powered By A Strong Vortec 350 With The Turbo 400 Transmission And 3:23 Posi Rear End. This Car Was a Complete Frame Off Restoration Started in 2006 Took Over 3 Years To Complete If You Are Looking For That One Of A Kind Car You Can Drive Or Show Anywhere This Is It. Tons Of Documentation On This Car And Everything Is New. Here Are Some Of The High Points Powered by a Vortec 350, Vintage Heat and Air System, Power Steering, Power Front Disc Brakes, Custom Front Bumper, Custom Grill, Edelbrock Carb, Serpentine Belt System, Mustang Two Steering System, Chrome Headers Custom Exhaust System, Tilt Wheel, Leather Seats, Remote Start, Rear Air Vents, Boyd Wheels, Keyless Entry, And So Much More. Call TODAY!!! Message: Thought you might be interested in this 1947 Chevrolet Fleetmaster.